When talking about cable ties, you probably remember that time you used one to hold your keys or tools together when you were in a pinch. But do they remind you of race cars or the Mars Rover? They just might now. Although they may seem like an everyday household item, a commodity even, cable ties solve problems beyond simple life hacks – such as sealing an open food package to keep it fresh. The capabilities go far beyond your typical toolkit. Here are some unexpected places you may find them – and the surprising history behind this technology. These fasteners aren’t limited to life on land. Offshore structures, such as oil platforms, rely on the strength of cable ties to withstand the ocean’s challenges. From constant exposure to salt water, varying temperatures, and other ever-changing conditions, they overcome these underwater obstacles. Whether it’s a residential home or a 50-story building, cable ties can be found on the job site. Although this location may not seem like the most unusual, contractors have been known to secure wooden crates via cable ties to ensure stable transport of job site materials. Considering job site hazards and conditions, you may be surprised to learn that cable ties are used in the oil and gas industry. Subject to high temperatures and flames, it may be a questionable use to some, but they have proven their place in this industry. Maintenance and downtime can be a major cost factor in this field, meaning only the best products can be used in these harsh settings. You’re in a broken-down car in the middle of a frozen prairie. What are your options? A spare bag of cable ties in an emergency road kit may be just what you need to make it to your destination. This happened to a real group of travelers in rural Canada. In this story, the driver was able to create a make-shift serpentine belt for his truck with zip ties. He and his passengers made it safely to their destination. Solar power farms use cable ties to support equipment and keep panels running to produce energy for communities around the world. The amount of direct sunlight, extreme temperatures, and extended exposure times to UV rays make for harsh conditions. With innovative tactics, cable ties are a great fit for solar power projects. In one of the most unexpected locations, cable ties have a presence beyond the footprint of our own planet. Millions of miles away, on the rugged conditions of Mars, NASA’s Mars Rover has cable ties in its operating system. As it comes with the territory, these fasteners endure temperature variations, radiation, and the vacuum of space while the rover reports data back to Earth. Who would guess that within the engine of a high-speed race car, cable ties are used? When a Formula 1 race car is reaching peak speeds of 200 mph or more, cable ties are tasked with protecting the expensive equipment beneath the hood. At these speeds, temperature and vehicle movement must be tolerated without failure. Manufacturing plants in many industries rely on cable ties. But when talking about food and beverage manufacturing, the issue of contamination comes into play. Specialty ties are created to be easily detectable if one breaks and falls into a processing line. This keeps equipment in place for a smooth operation – and protects consumers from contaminated products. Just another unusual and innovative quality of cable ties. As you can see, cable ties can be found in nearly any project and in many unusual locations. But not just any fastener can handle these demands. When it comes to industrial and commercial uses, there’s only one cable tie that’s up for the job. 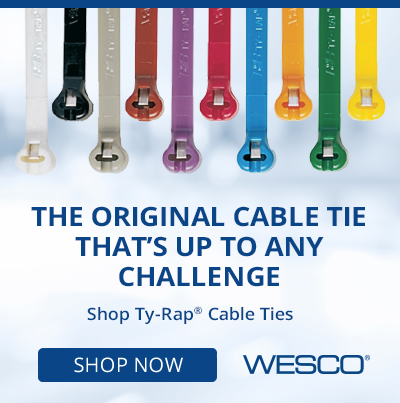 Ty-Rap®, the original cable tie, was developed in 1958. Originally designed to bundle cables in airplanes, the product line has since grown to provide cable ties for many instances. Celebrating its 60th anniversary in 2018, over 28 billion of these cable ties have been produced. Cinched together, that’s enough to reach from the Earth to the Moon 22 times and clinch around both equators each time. So the next time you stumble across a cable tie in your workshop drawer, take a minute to think about the amazing possibilities that fastener can bring to life. And when the job requirements are tough – even out of this world – remember Ty-Rap is ready for the challenge. *While not all of these uses are intended and specified for the original cable tie, we recognized that sometimes circumstances call for out-of-the-box thinking. The opinions expressed in this piece are solely the ABB's. They do not necessarily represent WESCO’s views. ABB is a pioneering technology leader in power grids, electrification products, industrial automation, robotics and motion, serving customers in utilities, industry, transport and infrastructure globally. Working with high voltage power systems carries many hazards and inherent risks. According to the U.S. Bureau of Labor Statistics (BLS), the electrical fatality rate in the mining industry is approximately 8 to 12 times higher than the rate of other U.S. industries. In circumstances that call for temporary power, the long-standing approach has been to cobble together an electrical system using whatever extension cords and portable power supplies may be on hand. Although applications that call for portable power are inherently impermanent, it’s important not to sacrifice safety and increase the risk of trip-and-fall, electrical shock or other injuries. Electricians often perform repetitive motions, twist their bodies in awkward positions, and handle heavy materials. To protect their field workforce from strains, sprains, and career-inhibiting injuries, many of today's top electrical construction firms are focusing on ergonomics.